Suzuki's still-secret GSX-R250 has been spied in finished form and this computer-generated image reveals what the production version will look like. 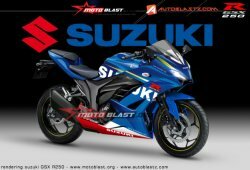 According to our source at the company, the new Suzuki GSX-R250 is being made to rival machines like the Yamaha YZF-R3, Kawasaki Ninja 300 and the soon-to-be launched Honda CBR250RR (twin-cylinder) – which was shown as the lightly-disguised Light Weight Super Sports concept at the last year's Tokyo Motor Show – will make it a full house for the 250 to 300cc class. While blury spy pictures suggest that the new 250cc Suzuki's engine cases look very similar to those of the much less powerful GW250 Inazuma (which manages just 18kW from its 250cc twin), our source at Suzuki say the engine is significantly different. It needs to be if the motorcycle's performance is to meet that of its rivals, like the Yamaha YZF-R3. The sudden renewed enthusiasm for the 250cc sportsbike class partially comes down to racing. This year sees the introduction of the new JP250 race class in Japan, running as a support series to the Japanese Superbike Championship, and there are plans to introduce an international series for 300cc-class production motorcycles at WSBK rounds, perhaps as soon as 2017. However, that idea in turn reflects the fact that small-capacity sports models are increasingly important in some markets, particularly Asian ones. A small-capacity race class will give a marketing boost for motorcycles in that category while also providing WSBK with a feeder series structure (300cc, 600cc and finally 1000cc) that mirrors the one in the MotoGP. Both the new Suzuki GSX-R250 and Honda's twin-cylinder CBR250RR are expected to be in production well before the end of this year.